Music: Kris Delmhorst, "Cluck Old Hen." Let's make some room for the impending AVALANCHE OF BOXES! 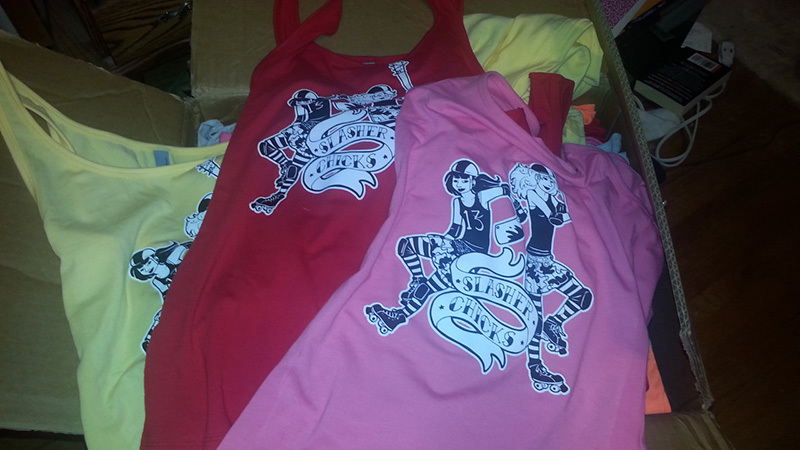 I'm home from my last convention of 2014, and am selling some more Slasher Chicks tank tops to make room in my staging area. Be a roller derby hipster in a shirt for a team that doesn't exist! With art by the fabulous Sfe Monster, this was our first experiment with printing on bright colors for fun times. All tanks are fitted (no straight cuts this time, I'm afraid). Dark gray, out of stock. All shirts are $20 + $5 shipping US/$12 shipping International. If you want a shirt, comment here, and I'll provide payment info and all that fun stuff. You must comment here to request a shirt. Do not use LJ messenger or send me email, or anything else. Just comment here. I will be making a mail run next week, so shirts ordered now should reach their recipients before the holidays. ETA: Folks, the instructions given when you place a request (IE, PayPal to one place and send your mailing address to another) are not optional. I cannot easily extract your mailing info from the PayPal alert. I need you to send it through my contact form. Until you do, even paid-for shirts will not be mailed.